Enchroma says its lenses help the brain make distinctions between colors. A new type of glasses may help people who are color blind see the world in a whole new way. The Berkeley, California-based company EnChroma developed glasses with lenses that contain a special vertical filter that blocks out certain wavelengths, which helps the brain make distinctions between colors, according to the company’s chief scientist Don McPherson. 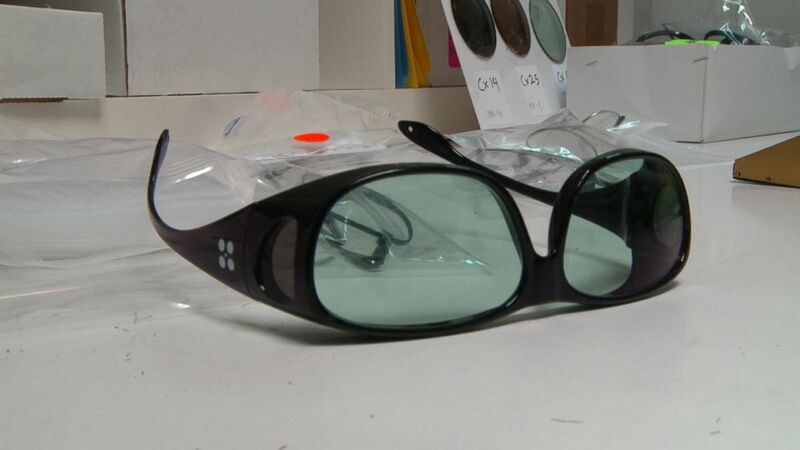 Initially, McPherson said he developed the glasses as protective eyewear for surgeons. “They were made for blocking certain wavelengths of light for laser surgery,” said McPherson. But one day, McPherson said he discovered another purpose for them while playing ultimate Frisbee with a friend who was color blind. (ABC News) Enchroma lenses contain a special vertical filter that blocks out certain wavelengths and help the brain make distinctions between colors, according to their chief scientist Don McPherson. EnChroma’s glasses are for enhancing color vision, McPherson said, but some critics are skeptical. Dr. Mark Fromer, an attending ophthalmologist at Lenox Hill Hospital in New York, doesn’t believe these glasses can change the color-blind eye’s ability to see true colors. But McPherson disagrees, saying that EnChroma can help give people with color blindness an improved quality of life. “The world is wonderfully colorful, and to not fully experience that is a shame,” he said. To test out EnChroma’s promises, “Nightline” embarked on a non-scientific study with three color-blind people: a fifth-grader named Maddox Rochman-Romdalvik, Danielle Castro, an artist from San Francisco, and Oscar Puente from Queens, New York, who dreamed of being a fighter pilot until he discovered his colorblindness prevented it. All three people took EnChroma’s online color blind test before trying the glasses. The test predicted Maddox had only a 30 percent chance the glasses would work. Danielle had a 75 percent chance, and Oscar scored 90 percent. Maddox and Castro took the Ishihara Color Vision test, which uses different colored dots in various patterns, called Ishihara Plates, to determine partial or complete color deficiency, without the EnChroma glasses on. It’s a test that many ophthalmologists call the gold standard for color blindness tests to determine. After the test, It was determined that Maddox had red-green colorblindness, the most common type, which EnChroma said its glasses correct. Castro took the same test, which also yielded similar results to Maddox’s. (ABC News) Maddox Rochman-Romdalvik (center) tries EnChroma's glasses for the first time in the San Francisco Botanical Garden. Then they both put on a pair of EnChroma glasses. 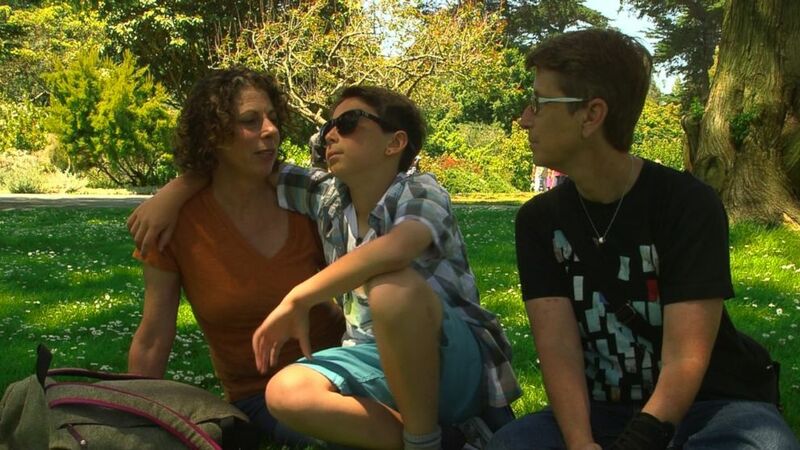 Maddox went to the San Francisco Botanical Garden to try out the glasses, but when he looked around he said he didn't see anything different. When Danielle tried the glasses, she was able to see a stark difference in several colors at once. Across the country in New York, Puente tried on a pair of EnChroma’s glasses with his fiancee and was taken aback at the colors he could see in a bed of flowers. He then looked at a traffic light and had an even bigger reaction. After testing the glasses outdoors, Maddox and Castro retook the Ishihara test with the EnChroma glasses on. For Castro, her results were unchanged, but McPherson said he could explain why. “The Ishihara test is not a valid test for measuring color deficiency. We’ve never used it for the simple reason that the test is not designed to be used with a filter,” said McPherson. McPherson said the company used during a different color blindness test in their clinical trials called the Farnsworth test, which uses trays of small disks with different hues on them. Puente took the Farnsworth test with his longtime ophthalmologist Dr. Stewart Levine of Queens, New York, first without the EnChroma glasses and then with them on, but it appeared that he did worse on the Farnsworth test wearing the glasses. But Castro and Puente said they couldn't care less about the test results. Oscar has since bought one pair and said he’s buying another. “It was pretty amazing, a lot of new information. I’m pretty excited to get my hands on these glasses full time and see a whole new world,” said Puente.